After launching "Cassiopea", Holland Jachtbouw is going to build "Bella Vita", a new superyacht whose design was completely entrusted to Pieter Beeldsnjder from PB Design. This yacht, which is going to increase the already big fleet of sailing yachts, in whose building the Dutch yard is specialized, will be the second motor unit after "Cassiopea" from the Northern European builder. 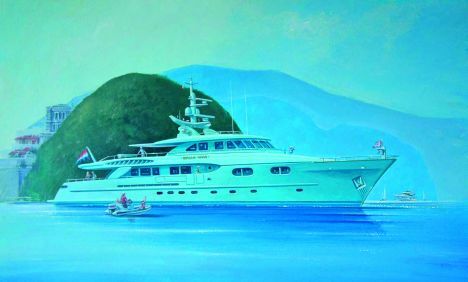 Her main feature is the great liveable interior improved by a maximum beam of 7.75 metres: it will offer twelve cabins in the sleeping area, including the owner's suite, guest cabins, VIP suite plus a crew's quarter for six people. The huge galley features all accessories for long cruising while the multi media system comprises all current tech - equipments for entertaining. "Bella Vita" will mainly cruise in the Mediterranean Sea at a cruising speed of about 12/13 knots provided by a pairing of MTU, each of them capable to supply a power of about 960 HP. To "Bella Vita" will follow two new modern - styled sailing yachts, 37 and 40 metres respectively, under construction at the Dutch Yard now: the former was designed by Dixon Yacht and the latter by Hoek Design; both are the builder's regular partners.